If you’re a radio buff, you must have heard the song “Malapit Na Ang Pasko” as it has become one of the Christmas songs played on the radio, AM or FM band, this holiday season. And guess who sang and recorded the song? John Melo! If the name doesn’t ring a bell, it means you were either out of the country in the late 80s, or you weren’t born yet. But, John Melo is one of those who made waves in the late 80s and in 1992 his name nearly became synonymous to OPM with the tune “Ikaw Pala ang Minamahal” that gave him an Awit award for Best New Male Performance. Showbiz folk in the Philippines believe that once you’ve stepped into the entertainment door, you could step out but your heart remains inside. And that exactly what happened to John. While engaged in another profession (real estate and dental management), his mind intermittently has been snowed under, as the saying goes, with thoughts of doing something showbizzy. His friends egged him continually and even check here suggested he met with songwriter and fellow émigré Jimmy Borja (which he did) to ask him to write a Christmas tune for him. The result is “Malapit Na Ang Pasko” and he uploaded it onto his Facebook page after recording it last year in San Francisco. To date, it has over three million views, and his friends in the US have tagged him as the OFW Prince of Christmas Song. Motivated by the response of fellow Filipinos overseas to his Christmas ditty, he decided to fly back to Manila and promote it in the Philippines. Thus far, he has been elated that there are still people in the industry that remembers me. Long-time fan magazine writer now radio commentator Christy Fermin interviewed John in her program on TV5 radio. He also made a guest appearance in Wowowin with host Willy Revillame. “Alay ko talaga ang kantang ito sa mga gaya kong OFWs. Alam ko ang pinagdadaanan ng mga kababayan natin at dinanas ko na rin yan,” John said. 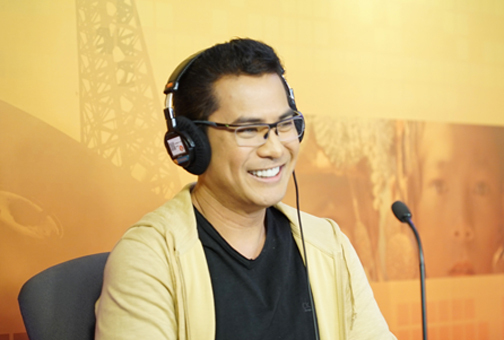 His 1992 album Hanap-Hanap Kita from where the hit single “Ikaw Pala ang Minamahal” was taken, was certified Gold. Vehnee Saturno wrote the tune for Ivory Records. In1994, John also recorded another album, Magtiwala Ka with the carrier single “Basta’t Mahal Kita” that Saturno also penned. While the number of views of John’s Christmas song continues to grow, comparisons with “Sana Ngayong Pasko” by Ariel Rivera and “Pasko na Sinta ko” by Gary V are becoming inevitable. But, for John Melo, his only dream now is to be on the same tracks as Jose Mari Chan who is known to many Filipinos as the “Father of Christmas,” thanks to his Christmas ditty that has become Philippines’ national Christmas anthem.